Finally. We noticed on our morning power walk earlier this week…. a slight chill in the air. A distinct chill. At last, the daytime temperature has dipped enough (at least here in eastern Canada) to be considering fall fashion. I mean considering wearing it… instead of just thinking about it. Part of the route Hubby and I took on our morning power walk earlier this week. And I’m deciding what pieces will be in my early fall “rotation.” You know, outfits for those glorious days when it’s cool enough to wear a sweater or blazer, but still warm enough to wear loafers and sneakers without socks. And maybe a bit too warm for boots. Of course, I’ll be wearing my “fall essentials,” which I wrote about in a post last week: white shirt, white tee, sharp black jacket, jeans. But a girl can’t live in white tops and jeans alone. So for this post I’ve pulled together some of the images that I’ve pinned up on my “inspiration board” to remind me of what I want to wear this fall. In my Fall Rotation… Round One. This shot below from Net-a-porter.com was in my mailbox a while ago. With a mantra I can get behind…”Love. Wear. Repeat.” And an image that I can get into… literally. Silky blouse, tweed blazer, jeans. That’s a combination I’ve worn (and loved and repeated) in some form or other since my university days. This image from Michael Kors reminds me why I love fall. Camel, and brown, and gold, and cognac, and that luscious houndstooth tweed. I looked and looked and could not find out anywhere what MK actually calls the colours in this coat. Let’s just call them delicious, shall we? 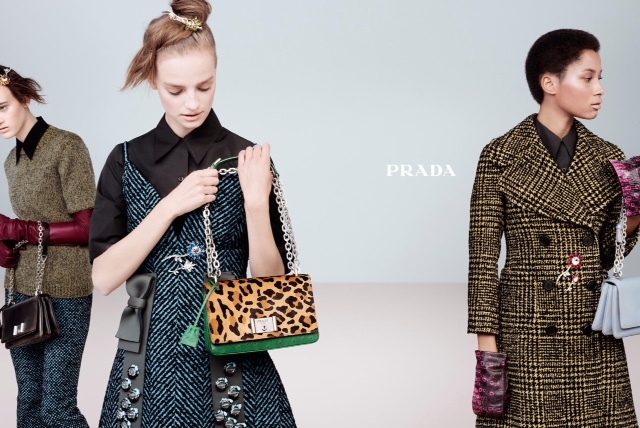 I love the mix of textures that Prada is showing. And the prim little shirts buttoned all the way up. And the tweed, of course.This is the shot that’s pinned up on my inspiration board. Tweed. And brooches. Lots of brooches. Hallelujah. Love, love, love my vintage brooches. I’ve always worn them. I remember when they were very cool, sometime back in the early 2000’s. And so they are again. At least at Prada. And at Chanel. It seems that tweed and your grandmother’s brooches are back together in a very big way. And except for the funny up-dos… I could go for any of these looks. Only with jeans and boots on the bottom half. And this image from AG jeans is on my inspiration board to remind me to wear my new, crisp blue shirt from Equipment, with a fall coat, and jeans. Or black pants. I love this ad campaign from AG Jeans featuring model Daria Werbowy. And the simple, pared down, seemingly “undone” looks. Most of us could never hope to just roll out of bed, run a comb through our hair (or not), pull on a shirt, jeans and a coat… and look as good as Ms. Werbowy does here. Then again, if she could just roll out of bed and look like this, there would be no need for the stylist, or the hair and make-up team, would there? Nothing against Ms. Werbowy; she’s lovely. Just that we should all recognize that it takes a lot of doing to look this perfectly undone, if you follow me. But I digress, as usual. I also love this shot from J Crew. 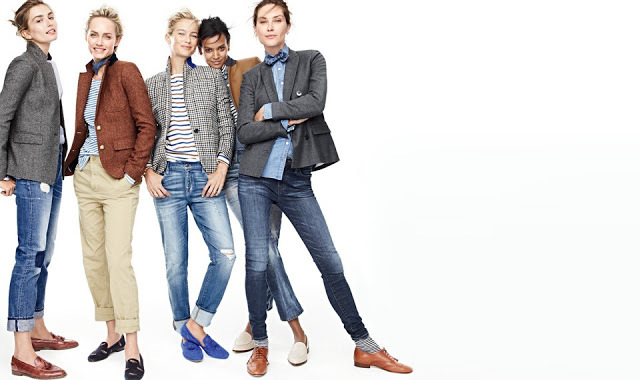 Again with the jeans, tweed blazers, blue shirts or striped tees, and loafers. This reminds me not to forget a couple of cropped, tweed blazers I own… and my soft and lovely Tod’s “driving shoes.” I bought the shoes with my retirement gift certificate. They’re great for early fall. Just that perfect bronze-y luggage leather colour to wear with denim and tweed. And then there’s this shot from Vince.com. Love this cozy coat sweater with loafers and cropped leather leggings. Makes me long to haul out my new Vince coat sweater. And my old faithful black leather trousers. And my black Stuart Weitzman loafers. And my new burgundy Marc Jacobs bag. Ooooh, the anticipation is killing me. So Fall Rotation… Round One. Tweed. And to wear with tweed… check out my new fall purchase. Gorgeous brown booties from Paul Green. I loved these the minute the salesgirl suggested them. The slightly square toe, the tassel on the zipper pull, the detail on the toe and heel. And that stacked heel…not too high…yet not exactly flat either. Oh, and the colour. That delicious brown… would you call that milk chocolate? And the pièce de résistance… it’s as if they were made for my narrow feet. Usually Stuart Weitzman is my main man for shoes. But I am about to find myself happily cheating on Stuart with Paul. So… tweed jackets, jeans, leather pants, cosy coat sweater, vintage brooches. That’s Round One sorted…. sort of. Now I just have to remember to wear them. Stay tuned for Fall Rotation: Round One Point Five…with me actually in the clothes. What are you wearing to usher in the fall season? We have similar inspirations! I'm looking for some softer jackets in Any Color But Black™, not that easy to find! (The J.Crew jackets are nice this season, just too stiff and structured for me.) Oh, you're going to love those Paul Greens! That brand is SO comfortable, and those are gorgeous. Saw some lovely burgundy/merlot/cognac jackets at Zara yesterday. They look great from a distance, all pressed and on the manikin, but I find that their quality can be a bit sketchy with some things. And everything is pretty structured isn't it? It's funny, I think the same thing when I look at your blog…that we often like similar things. I had to smile at your comment "I just have to remember to wear them" I have that problem too. I bought a tweed jacket last Autumn … Background a shade of French navy with some gold and dark plum. Great I thought this will go with so much in my wardrobe… I wore it once!! A week or so ago I suddenly though how nice it would look with my chambray boyfriend style shirt….. as you say, now I just have to remember to wear it!! Your new boots are a perfect height to be stylish as well as comfortable. It's lovely to see the clothes in all the "Autumn colours" … Browns golds Carmels etc Great post Sue …. All we need now is the right weather … It's still warm and sunny here at the moment! Your jacket with the navy background sounds wonderful. With your chambray shirt and jeans…it would be great. Maybe hang it in the doorway so you can't leave the house without running into it? I'm thinking I'll hang a whole outfit together right in the middle of my closet so when I open the door I'll go…"Oh. Yeah. There's that outfit." Thank you Sue! Hanging the whole outfit together including the jacket is really good advice. I think what Wendy said was definitely the case last year where we seemed to go from the warmth of summer into Winter! Maybe I need to plan an outfit with the jacket , jumper and scarf!! For me it's tweed jackets , slimmish trousers or jeans & boots . Though my current favorite jacket is a Margaret Howell thick corduroy in a dark rusty red . I'm liking the slightly longer jackets now . My usual colours are blues or grey , with a little black ,rather than browns but I do like brown bags & boots , your new boots are lovely , great colour . Like you , I've gathered a collection of old brooches & it would be nice to wear them again . Sometimes our late summer warmth can turn into winter coat weather overnight & the autumn jackets don't get an outing , hope that doesn't happen this year . Me too, Wendy…tweeds, narrow jeans, boots. My uniform. 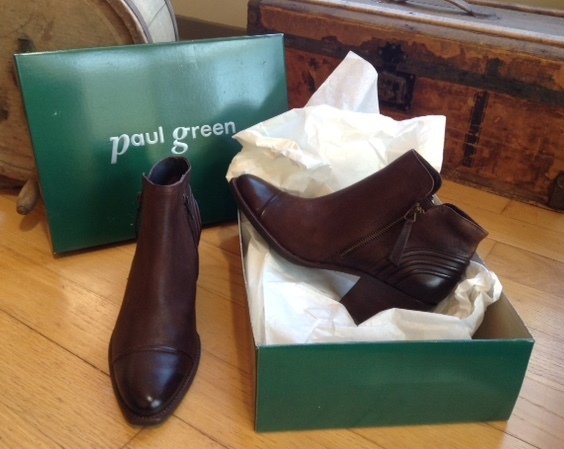 My new Paul Green boots remind me of the distressed leather purses we all carried in the 70's. I may see if I can get a bag to match my boots at the Vintage Clothing Show here in November. I know what you mean about the weather….I'll have to hurry up and start going places just so I can wear my jackets and brooches before the snow flies. And we never know when that's going to happen..
Hi Sue, I meant to add that I thought your idea of a virtual book club was a good one! No, I wasn't all that enthused with his shoes either. But I love the boots. Milder here as well, Iris. But later this week we'll have some tweed & boots weather. Great inspirations! I really want every item from that vince.com shot. Vince clothes are great aren't they? Thanks Patti. You'll have to visit us up north for that fall feeling, I guess. Great pictures! I love fall fashion! WHAT AM I wearing………..actually I still have the LINEN on but in FALL COLORS!It is still VERY warm here. Everyone always talks about an INSPIRATION BOARD……………….never had one!Perhaps, I need to reconsider that!!! Loved your make over at DAILY PLATE OF CRAZY!!! I love my inspiration board…just a collage of pictures on my bulletin board…so I can't help by see it when I'm working on my computer. It takes the place of all the work memos, schedules, to-do lists that used to be pinned up there and is a lot less stress engendering! 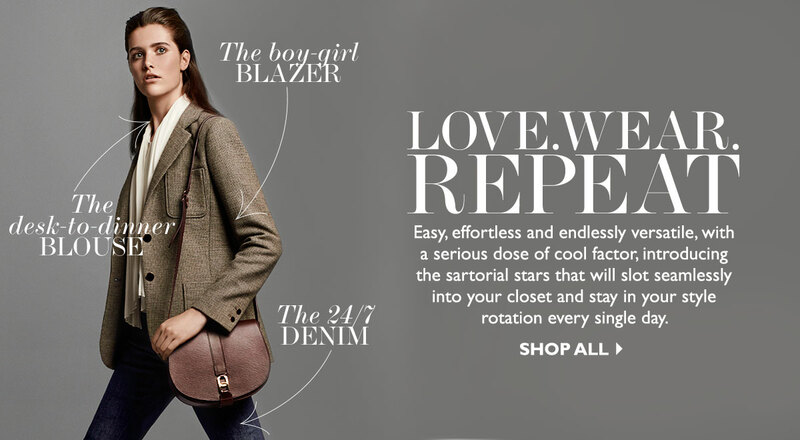 I have been wanting to add one of those J Crew Blazers to my fall wardrobe. Love that Vince Sweater as well. If only I could still wear boots like that I would order those up in a flash. Instead I have to search for a more comfortable option to accomodate the bunion!! I love Vince sweaters. And boots. It's so hard to find footwear you like when you have foot issues like yours, isn't it? You have some delicious pieces lined up for fall, Susan! Vince has been capturing my eye this year. I'm with you on the shades of autumn-truly my favorite season to dress for. I'm so ready for a chill in the air. 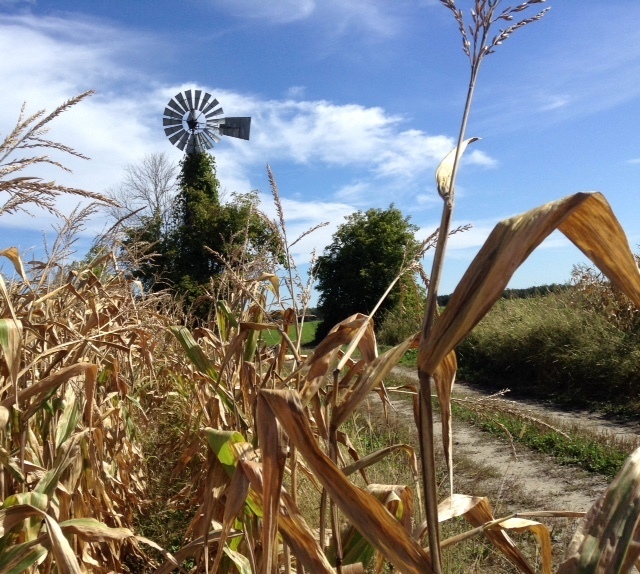 We even had some rain here yesterday–finally. Happy weekend and thanks for bringing your style to our Lifestyle Linkup this month! Thanks Heather. Very cool here today. I'll have no problem hauling out the comfy sweaters this weekend! I love all these looks. reminds me so much of Ralph Lauren, only better. I'm a big fan of brown this fall. And looking to swap out a LOT of black! I'm actually sick of black. Shhh…you heard it here first:) I love Paul Green, so comfortable! Susan, it's nice to see what inspires others in their style choices. I think you are going to love mixing the brown booties with your blacks. I am thrilled to have you join our first My Refined Style Linkup…I hope you will come back for many more! Thanks Shellie. I love the idea of another over 40 link-up! I'll be back for sure. I adore all the rich fall colors. Great variety and tones for the fall as well. The leather booties are rich and lovely as well!